What would Haruka be without her voice? This little section holds the few information I could gather on Haruka's various seiyuu. Megumi-san is Haruka's voice in the Japanese original. I've only had the chance to hear her twice, but I think she's very talented ^_^ She's acted in many other famous anime roles, including male ones, such as Shinji Ikari (Neon Genesis Evangelion) and Eagle Vision (MKR). 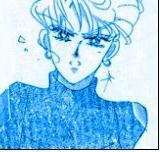 Maddalena-san is Haruka's voice in the Italian dub. I've heard her often, and IMO she's as good as Megumi Ogata. She, too, has acted many anime roles, both female and male (she's been Akane in Kimagure Orange Road and Sei Arisaka in Hime chan no ribon).